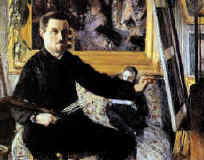 Gustave Caillebotte's personality was fascinating. He was a man of many interests, and thanks to financial comfort from a family inheritance, he plunged ahead in all his passions, whether in the field of art, or gardening, or nautical sports. Realistic and organised, modest and generous, he devoted himself constantly to the cause of helping his fellow painter friends. And it can fairly be said that without Caillebotte, Impressionism might not have had the influence that it gained, which permitted it to change the face of art at that period. Born in a family of wealthy merchants, Gustave studied law at first, but soon after steered towards painting. He painted his first works at the family's summer home in Yerres, not far from Paris. He saw the first impressionist exhibit of 1874, which gave him the chance, even though only 26 at the time, to meet the painters of the "new school" whom he would after frequent the rest of his life. Gustave Caillebotte, however, never really considered himself as a great painter. The fact that he was wealthy and didn't need to sell his works to live didn't help, either, in getting him recognised as quickly as his painter friends who did had to sell theirs works. His early death, and his painting years numbering only roughly twenty - interspaced with his other activities and passions - make it that it is only in recent decades that he has finally been given the credit he deserves for his part in the Impressonist movement. At the age of 26, at the death of his father, Gustave inherited a large fortune that he would use wisely. It was intended to allow him to live without struggle and to help his Impressonist friends whom he admired. 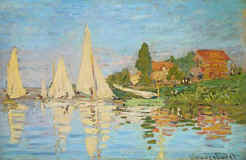 And so it was that in 1876 he purchased "Regatta at Argenteuil" from Monet who was in need. Caillebotte even lent him money and paid the rent of his studio. 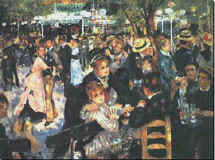 Bigger spending was to follow : to help Renoir, he bought "Le Moulin de la Galette". 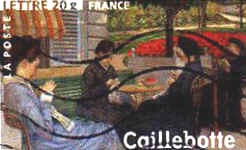 He also bought works from Degas, Pissarro and others and later Manet's "The balcony", the style of which is not without resembling Caillebotte's early works. Some Impressionist exhibits were financed partly or entirely by Caillebotte, without whose help wouldn't have taken place. At the death of his brother René in 1876, Gustave who had apparently a premonition of his own early death, drew up a will by which he gave to the French state all the works he would buy from his friends - 67 in total. However, the list included none of his own works, which he might have felt did not come up to the standards of those of Renoir, Manet, Degas or Pissarro. 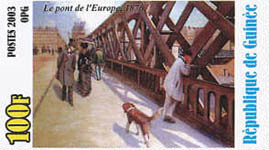 Caillebotte's donation today forms an important part of the collection at Orsay Museum in Paris. Gustave Caillebotte gave all his time and all his trouble in organising five Impressionist exhibits between 1876 and 1882 - getting the artists together, finding locations, setting up grand openings, and even deciding on where each work would best be hung. His talents as an organiser were evident in other domains such as gardening, nautical races and events, and even as a leading figure in the local government of the Gennevilliers community. Along with his brother Martial, Gustave had built up for years a considerable collection of stamps that was sold to an English collector for an astronomical sum. The collection is today an important part of the philatelic fund of the British Museum. From the Yerres period when the Caillebottes possessed a large kitchen garden, Gustave became interested in gardening, and his paintings show proof of this. 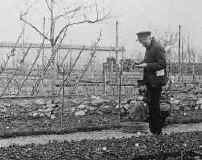 Later, at Petit-Gennevilliers, his house was surrounded by a vast garden and a huge conservatory where he spent time with his gardeners, planting and cutting. Many of his last paintings were dominated by the theme of the many flowers he so loved to grow. His talents as a gardener were recognised by all, which can be witnessed by his correspondance back and forth with others. Monet himself took advice from him when he was creating his garden at Giverny. Since the Yerres period, nautical sports, already popular in England, were now so in France as well. The Yerres property was bordered by the Yerres river, and the row-boats and skiffs were everywhere on it. 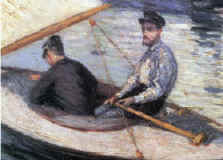 Caillebotte himself was a fervent practitioner of these sports as were his friends. And from 1877 onward he painted numerous works depiciting this. But at the death of his mother in 1878, the estate at Yerres was to be sold. In the meantime however, he had discovered the pleasure of sailing on the Seine and had become a member of the Sail Club of Paris, based in Argenteuil (he will even be its vice-chairman in 1880). It's there that he won his first regatta. 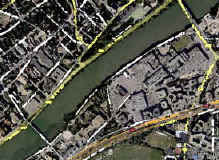 He knew there was the right place for him to settle and he purchased a property in Petit-Gennevilliers on the left bank of the Seine, just across from Argenteuil. 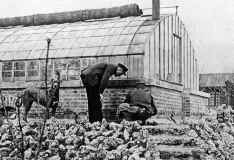 As he used to, he gave all to his passion and created a ship-yard next to his house. There he drew many sailboat blueprints, built some of them, and again won many competitions at their helm. To-date still, his "Roastbeef" and "Lezard" are remembered, and replicas have been recently constructed. The Sail Club of Paris did not restricted its activities to the Seine basin, it also used to organize regattas at sea in Normandy and Brittany. There Caillebotte became famous by winning many competitions on the "Dahud" he had designed for sea, specially in Saint-Malo in 1893. 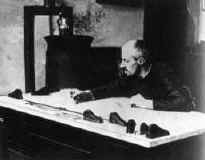 There too he was to introduce Paul Signac to yachting. Soon after he settled in Gennevilliers, he was elected as a member of the City council. As he usually used to do, he devoted himself to the city affairs and to avoid the traditional slowness of the local administration, he didn't hesitate paying with his own money some charges like public lighting, street paving and firemen uniforms. His death was deeply affected by his friends and by the critics - who had not always been kind with him. The fulfilment of his will was to be widely talked about for years and in a certain way made everybody lose sight of his talent as a painter. He now lays at the Pere Lachaise cemetary in Paris.